Content is from the site's 2009 - 2012 archived pages. Welcome to the website for the Pennsylvania Turnpike’s Lehigh River/Pohopoco Creek Bridge replacement projects. As part of our continuing investment in America's transportation infrastructure, the Pennsylvania Turnpike Commission is replacing two bridges on the Northeastern Extension (I-476) in Carbon County with four new spans. The structures are located approximately two miles north of the Lehigh Tunnel between mile markers 73.52 and 75.29. We'll use this portal to provide you with transparency into the progress of construction and any traffic impacts that you may encounter on the Turnpike or the local road system in the project area. An aside: It was great that the Pennsylvania Turnpike Commission set up this website to update travelers of the progress regarding the two bridge replacements. It certainly saved me a lot of time and grief during the approximately two years it took to complete. I used Interstate 476 frequently to travel to Scranton from Philadelphia. Now that I am located in NYC I take Rt 80 and never even get close to the Lehigh River, or the two new bridges. Recently I visited my upstairs neighbor to thank her for the great carpet cleaning company Brooklyn based that I used at their recommendation. I had several lovely antique carpet that needed to be not only cleaned, but also repaired. My neighbor had used, Sunlight Fine Carpet Cleaning and Repair on several ocassions. Her suggestion was so helpful. The rugs had been returned the day before and I couldn;'t have been more pleased. I made some rugelach as a thank you gift. While we were enjoying the cookies with some tea, our conversation somehow ended up relating driving stories. I told her about my travails driving to Scranton in the winters while the Lehigh River/Pohopoco Creek Bridge replacement projects were underway. She had just recently driven over the bridges while on a tour seeing fall leaves. Sometimes the world is so small. As part of our continuing investment in America's transportation infrastructure, the Pennsylvania Turnpike Commission has replaced two bridges on the Northeastern Extension (I-476) in Carbon County with four new spans. The structures are located approximately two miles north of the Lehigh Tunnel between mile markers 73.52 and 75.29. This project is a continuation of the Commission's self-funded, 10 Year Capital Improvement Plan that has been developed to address the need to rebuild and modernize the more than 600 miles of interstate highway -- and mainline structures -- under its jurisdiction. Soaring as high as 125 feet over the scenic Lehigh River and adjacent Pohopoco Creek, the bridges have been replaced with $101,558,000 in funds generated by the users of the Turnpike. This investment has provided hundreds of quality jobs on-site, at material suppliers and in the communities surrounding the work area, pumping much needed capital into the region and generating significant payroll taxes for Pennsylvania's economy. The new structures -- two northbound, two southbound -- are designed to serve Turnpike motorists over the long term, and they have been constructed in harmony with the Pocono Mountains' environment and at minimal impact on the rich and scenic waterways that they traverse. Our website is designed to allow you to actively participate by providing an open view into the details of the project and the construction process as we complete the building of new, state-of-the-art bridges at the gateway to a mountainous region that is home to many and a relaxing escape for many more. Take a look around. Sign up to be part of our active information program that pushes timely information to your e-mail box or cell phone. Ask us a question or drop us a line anytime. We'll get back to you quickly, and we hope that you'll come back often to see the progress that we are making. With the new rates - that will take effect at 12:01 a.m. - the most-common cash toll for passenger vehicles will increase from $1.10 to $1.25 while the most-common cash toll for a standard commercial-truck classification (Class 5) will rise from $8.95 to $9.85. (The 2012 fares were determined by applying a 10 percent increase on top of the 2011 fare then rounding up to the nearest nickel.) The increase will be applied to all vehicle classes on all Turnpike sections except the Southern Beltway (Turnpike 576) in Allegheny and Washington counties, where rates will be unchanged. Turnpike Chairman William K. Lieberman of Pittsburgh said by not raising E-ZPass rates, the agency is easing the economic impact of a toll increase. "Since nearly two-thirds of travelers already use E-ZPass, only about a third of our customers will be affected," he explained. "For anyone without E-ZPass, I recommend you sign up soon if you want to have that transponder in hand before the end of the year." Getting E-ZPass is easy: Most customers enroll online at www.paturnpike.com or by calling 1-877-Penn-Pass (1-877-736-6727). Customers can also open an E-ZPass account at many of the state's AAA offices and at certain regional grocery stores including Acme, Giant Eagle, Get-Go and Karns. For a complete list of retail locations, visit www.paturnpike.com/ezpass/sales. Chairman Lieberman said there are several reasons to motivate people to get E-ZPass. "We believe it's important to encourage more travelers to switch to E-ZPass because of the numerous benefits, including economic, environmental and customer-safety advantages," he explained. "Collecting tolls electronically is not only safer, faster and more convenient for customers, but it is better for the environment because it helps diminish idling at the toll plazas and also reduces the Turnpike's operating costs." The cost to process an E-ZPass transaction is about four times less than the cost of handling a cash transaction; it costs the commission about $1 per transaction to collect a cash toll, and less than 25 cents per transaction to collect tolls via E-ZPass. The lower E-ZPass rates apply to all individual and commercial E-ZPass customers regardless of issuing agency or state in which an account was established. Presently, there are 24 E-ZPass agencies in 14 states, largely in the Northeastern U.S., and more than 20 million E-ZPass transponders in use on toll roads, bridges and tunnels nationwide. The 2012 increase is needed, in part, to satisfy the Turnpike's funding obligation to the Commonwealth of Pennsylvania. A 2007 statute expanded the Turnpike's role by directing it to utilize tollbooth revenues to help underwrite a transportation-funding shortfall. Under Act 44 of 2007, the Turnpike Commission continues to make annual contributions of $450 million to PennDOT; of that amount, $250 million is used for transit agencies across the state and $200 million is used to help fund non-Turnpike road and bridge projects. To date, the commission provided more than $3 billion to the state under this law. The 2012 toll increase will be the fourth rate hike needed to meet the debt-service costs associated with Act 44. Students from the Commonwealth Connections Academy (Lehighton) and their parents visited the site of the new bridges that carry the Pennsylvania Turnpike (I-476) over the historic Lehigh Canal and Lehigh River. The tour, arranged by their teacher Ms. Kim Evans, was part of a lesson in the 70 year history of the Pennsylvania Turnpike Commission (PTC). Information on the construction of the new bridges was presented by Bernie Bydlon, P.E., Construction Engineer Manager (PTC) and Aaron Barnes, P.E. Resident Engineer from Urban Engineers. Following the visit at the bridges, the tour group proceeded to the Turnpike Maintenance Training Facility; located near the Lehigh Tunnel, for a PowerPoint presentation by Mr. Barnes. The presentation took the students on a visual tour of the building of the new Lehigh River and Pohopoco Creek bridges from the start of construction in January 2009 to the finished product. The opening of the four (4) new superstructures to traffic was celebrated with a dedication/ribbon cutting ceremony on November 4, 2011. The group was then given a tour of the control room at the Lehigh Tunnel. Mr. Bydlon and Rick Vispi, Lehigh Tunnel and Field Training Superintendent (PTC), provided valuable insight of the inner-workings of the tunnel system. Multiple cameras provided a view inside the two tunnels from the control room above. Other systems required for the safety of the motorists and tunnel personnel were discussed. This included controls for the fans; TV monitors; motion sensors; fire alarms and carbon monoxide (CO) air monitors. Fan Room: Students are looking at the original motor for the fans for Lehigh Tunnel (#1) built in 1957 and rehabilitated in the 1990’s. Students were taken into the actual air duct of the NB tunnel where the huge fans circulate fresh air through the tunnel. Complete southbound Lehigh River bridge. Shift southbound Turnpike traffic onto new alignment. Construct concrete deck, parapets for northbound Lehigh River bridge. Continue rock wall excavation on the southbound Turnpike shoulder at south end of work zone. Construct abutments for Phopoco Creek Bridges. 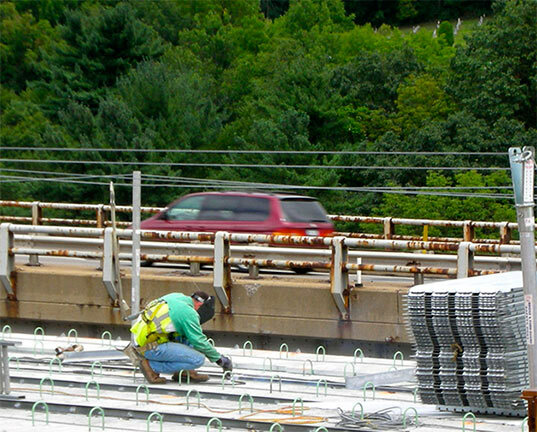 Construct abutmets for Lehigh River Bridges. Begin drilling Lehigh River Bridges pier foundations (19 total).